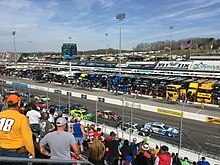 The 2019 STP 500 was a Monster Energy NASCAR Cup Series race that was held on March 24, 2019, at Martinsville Speedway in Ridgeway, Virginia. Contested over 500 laps on the .526 mile (.847 km) paperclip-shaped short track, it was the sixth race of the 2019 Monster Energy NASCAR Cup Series season. Clint Bowyer was the fastest in the first practice session with a time of 19.387 seconds and a speed of 97.674 mph (157.191 km/h). Chase Elliott was the fastest in the final practice session with a time of 19.413 seconds and a speed of 97.543 mph (156.980 km/h). Joey Logano scored the pole for the race with a time of 19.356 and a speed of 97.830 mph (157.442 km/h). William Byron, D. J. Kennington, and Jeb Burton all starting at the back due to failing inspection. Fox Sports covered their 19th race at the Martinsville Speedway. Mike Joy, nine-time Martinsville winner Jeff Gordon and 11-time Martinsville winner Darrell Waltrip called the race from the booth. Jamie Little, Vince Welch and Matt Yocum handled pit road duties for the entire race. MRN had the radio call for the race which was also simulcasted on Sirius XM NASCAR Radio. Alex Hayden, Jeff Striegle and seven-time Martinsville winner Rusty Wallace called the race in the booth as the cars raced down the frontstretch. Dave Moody called the race from atop the turn 3 stands as the field raced down the backstretch. Winston Kelley, Steve Post and Dillon Welch worked pit road for the radio side. ^ "2019 schedule". NASCAR.com. NASCAR Media Group, LLC. May 5, 2018. Retrieved March 2, 2019. ^ "Martinsville Speedway". NASCAR.com. NASCAR Media Group, LLC. January 3, 2013. Retrieved March 2, 2019. ^ "Entry List". MRN.com. Motor Racing Network. March 18, 2019. Retrieved March 18, 2019. ^ "First Practice Results". MRN.com. Motor Racing Network. March 23, 2019. Retrieved March 23, 2019. ^ "Final Practice Results". MRN.com. Motor Racing Network. March 23, 2019. Retrieved March 23, 2019. ^ "Starting Lineup". MRN.com. Motor Racing Network. March 23, 2019. Retrieved March 23, 2019. ^ "STP 500 Results". MRN.com. Motor Racing Network. March 24, 2019. Retrieved March 24, 2019. ^ "Points standings" (PDF). slpage.webfactional.com. March 24, 2019. Retrieved March 24, 2019. ^ "Manufacturer standings" (PDF). slpage.webfactional.com. March 26, 2019. Retrieved March 26, 2019. ^ "STP 500 ratings". ShowBuzzDaily. Mitch Metcalf. Retrieved 26 March 2019. ^ Utter, Jim (March 23, 2019). "Stewart-Haas Racing's Fords lead Saturday's first Cup practice". Motorsport.com. Ridgeway, Virginia: Motorsport Network. Retrieved March 23, 2019. ^ Utter, Jim (March 23, 2019). "Chase Elliott and Hendrick Motorsports top final Cup practice". Motorsport.com. Ridgeway, Virginia: Motorsport Network. Retrieved March 23, 2019. ^ "Logano leads pack of Fords to front at Martinsville Speedway". Associated Press. Ridgeway, Virginia: AP Sports. Associated Press. March 23, 2019. Retrieved March 23, 2019.